Last summer, the Excelsior motor needed some attention. 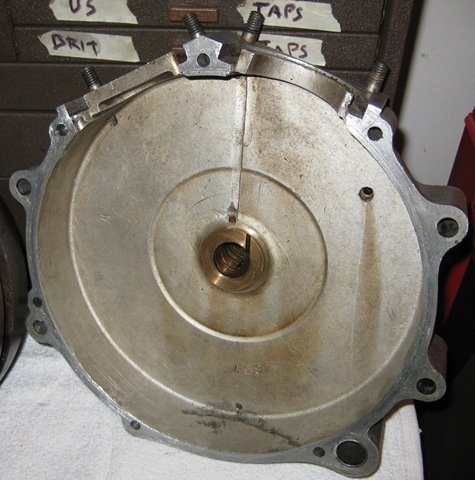 The timing side main bearing was too tight, the valves were worn, some hardware had been thrashed, and the cam followers were sloppy. While that list of items seems like a lot, the motor was actually in decent shape. It is a simple lump of metal to work on, 1000cc or 61ci with IOE valves. Plain bushings everywhere except rollers for the connecting rod big end. The main bearings were good, the cast iron pistons and rings fit the bores well, the cam lobes and timing teeth were fine. I did have to make one bushing for the timing idler gear (shown at the left of the first photo), but it was a simple lathe part from SAE 841 self lubricating bronze. First item after disassembly was to fix the main bushing. It was a new item, made by the old guy who used to be the caretaker for this machine. But it seems that he either got the numbers wrong, or didn’t finish the bushing after press fitting it into the cases. There was an interference fit between the mainshaft and the bearing of about .0005” It was simple for me to get my adjustable reamer, set to the correct size, and run it through by hand until I had about a .002” sliding fit on the mainshaft. 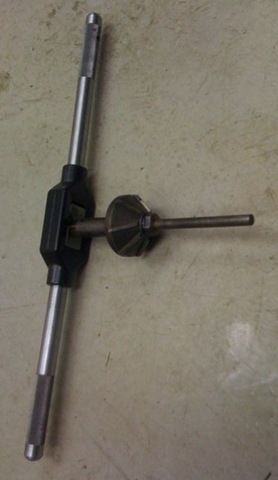 An adjustable reamer is shown below. It works just like a typical reamer to accurately size holes. But the adjustable reamer has blades that fit into grooves, and each groove is tapered in depth. By sliding the blades along the grooves, the blade rise or fall with the taper. A nut on each end of the blades holds them in place, locking the diameter that the blades will cut to. When using one, be sure to sneak up on your final dimension, adjusting just a bit with each pass. With all reamers, try to cut only about .010” total to finish the hole (that means you must drill it close to the final dimension before reaming). 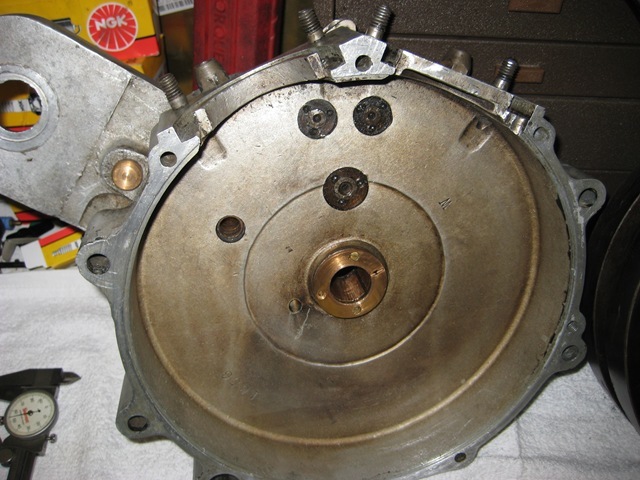 Flywheels and crankcases: Timing side is in the left of the photo, drive side is on the right. The Excelsior has a ‘forked’ connecting rod at the big end, as most V twins do. Notice the primitive oiling. When the spinning flywheel picks up oil from the bottom of the crankcase, it tosses the oil onto the sides of the crankcase. Then it gets caught in the vertical groove, and runs down into that little hole, then drips onto the crank which is riding inside the bronze main bushing. The flange of the bushing has a groove cut into it to catch any loose oil for the same effect from the edge of the mainshaft. Kibblewhite had valves in stock that would fit. But of course they were a bit too long and too large of a diameter, etc. 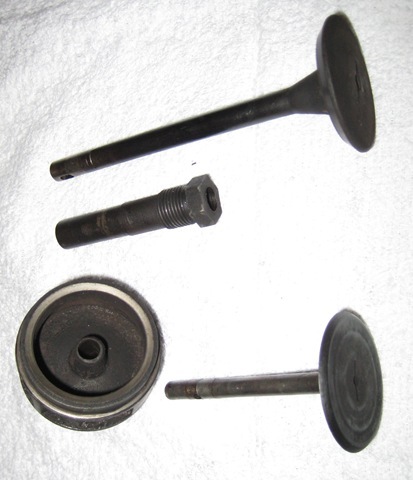 But they supplied shortened valves with hardened tip, and I used the lathe to cut a 3 angle surface on the valve head. Cast iron bar stock was used to make new guides on the trusty lathe. Cast iron is the material that was always used on early motors, due to it’s ability to lubricate the valve stems well without a complex oiling system feeding them with fresh oil. 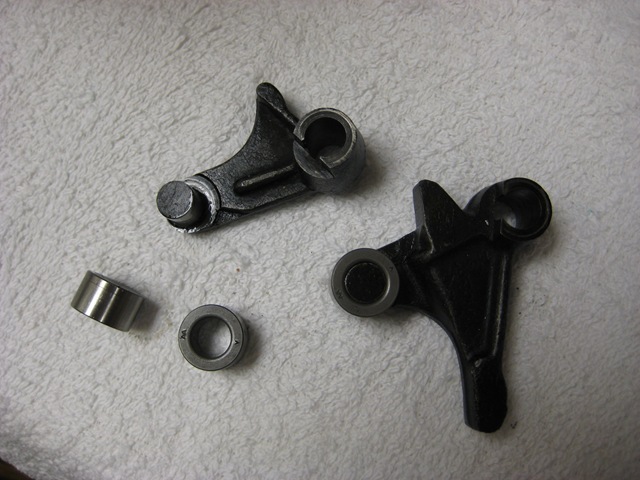 Excelsior valve guides are shaped quite a bit different than modern equipment. The IOE arrangement means that the exhaust guide is very long, and X decided to thread it into the head/barrel casting. It wasn’t too tough to remove after heating with a torch and fitting a good socket and extension on the ratchet. The new guide was just a thin sleeve of cast iron, with a small shoulder on the end to keep the new guide in place inside the old one. New guides were greased up, then frozen in the freezer overnight, while the old guides were heated in the oven. A quick press fit in the large vice, and they won’t come loose any time soon. Sorry, I don’t have any photos of when I machined the valves with the 3 angles seat, or of the intake seats being cut… But take a look at that intake cage. This is also the intake valve guide! All the air/fuel mix must pass through those slots, turn 90 degrees through the valve and then go down into the combustion chamber. I didn’t make a new cage, but I opened up the hole a few millimeters. Then I turned a bar of cast iron to fit (with a shoulder for safety), and pressed it into place. Afterwards, I chucked up the valve cage, bored a hole down the center to fit the stem diameter of the new valve, and also cut the 45 degree valve seat all in one setup. This helped to keep the seat concentric to the valve stem. 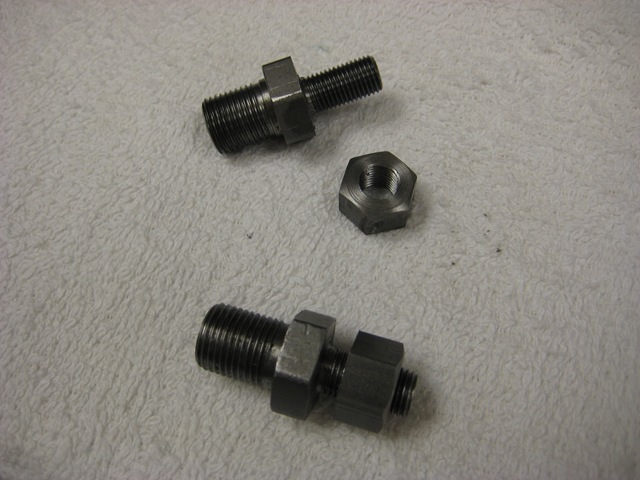 Some fasteners needed to be remade. These are the plugs at the top center of the combustion chamber, the nuts attach the motor to brackets on the frame. Pretty straightforward lathe work, but the big thread is odd, at .552” diameter. hmmm… oh well, I just made them to fit the threads in the heads. You can’t do that with a die stock, but cutting odd threads on the lathe is just as simple as cutting standard threads. While I was at it, I made a simple tap with the same threads to chase the hole in the heads and clean out the carbon and junk. Making a tap is surprising simple: just make a male threaded bar with two or four axial grooves ground into it. Add two flats for a wrench and viola! The roller cam followers were worn on their inner diameters, but the mounting post on the cam follower was fine. So I purchased some nice hardened drill bushings with the correct ID, OD and length. These are much harder than the originals, and should last for many thousands of miles without wearing out! And for just about $5-$10 each, the price cannot be beat. If you want a set, try tooling vendors like Carr Lane, Jergens, or a general outfit like MSC or Reid. The main bearings are bronze bushes? No MC22 hassles! Sorry to bother you again Pete, but I have a dilemma, after the engineer designed the engine, the pattern maker made the pattern and the foundrey worker poured the metal we had new 1912 Triumph cylinders with head attached. Then the machinist cut the bottom 10mm spigot off the barrel under the base plate,”don’t need that he said”!! I believe it had to be there for a reason, have these blind cylinders been ruined? Do you know anyone with expertise to give an informed comment. Hi Richard. The spigot gives the barrel some support where it joins the crankcase. The piston may ride in that part of the barrel, depending on the geometry of the stroke, rod length, piston height, spigot depth etc. If the piston doesn’t use that part of the barrel, and the crankcase is in good shape (good barrel studs, matched deck height, etc), then you might be ok. If the compression ratio is raised and/or bore increased, some early barrels break apart just above the flange. The spigot really helps to resist the piston thrust to the front of the barrel during the power stroke, by supporting the barrel with the crankcases. 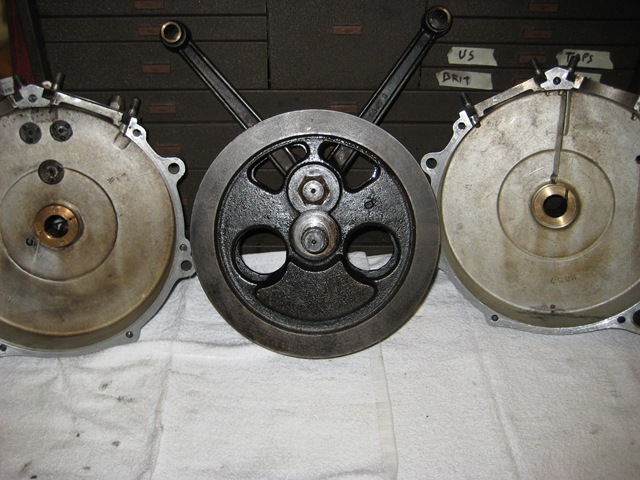 Since these early motors are long strokes and long connecting rod lengths, the geometry isn’t as acute as you would find in a more modern short stroke motor. That will help your motor to have less piston thrust against the bore. I’m sure that a good machinist could make a new spigot, say 20mm long. Then counterbore the barrel 10mm to take the new spigot, with 10mm remaining as the stock design. It would have to be attached well, you don’t want it falling into the motor! down the page 1/2 way. Thanks so much for technical run down on cylinder geometry and piston thrust, I don’t know how the heck I’m going to get those spigots back on? The machinist also decided to pull apart my cast piston, gudjeon pin,conrod and flywheels that were trued and ready to go into a motor. I’d left them with him so he could take more measurements for piston travel etc. He also decided to smack the six original hot rivets out of the crank pin so he could get it out for a look!! Do you have any idea how to fabricate and fasten a new, preferably hardened, crank pin? Can you use bolts instead of rivets? Maybe this could be a future ” How to” topic? I accidently clicked on the Folsom Street Fair! I don’t think I’ll ever be the same again. 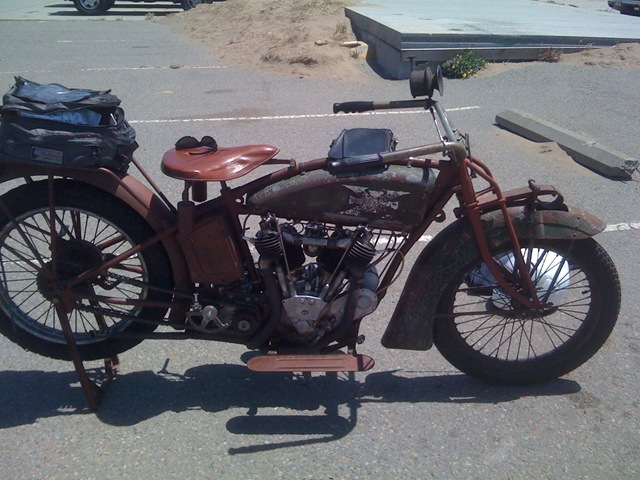 I have a 1913 Indian Twin motor that needed quite a few head and cylinder fins repaired. Now there are areas that have been welded and ground smooth. Is there a way I can ‘rough-up’ the smooth areas to match the cast iron “porous’ look that the rest of the top end has? You can try a rough sand blasting, but that probably will not give you large enough pits to match the rough cast iron. There is a pneumatic tool called a de-scaler that has a bunch of metal rods that poke out. That can give a texture that looks like cast iron. Good luck.